I have one of these personalities that just can't rest without knowing everything. Call it being a control freak (The Lass would agree with this one), call it being a know-it-all (I see my brother nodding his head furiously as he reads this) or simply call it the need to not be caught on the hop when asked an innocent question, I just can't let the niggling feeling in my head rest when I want to find something out. So, when I was wandering around my local supermarket, bypassing the everyday essentials I had actually been sent to get, I made a beeline for the alcohol-laden shelves of the wine department. Once there, I was excited to see a load of wines that I had never seen before. Not just new labels or new vintages, but new grape varieties that I had never seen on the average shopping trip and even grapes that I never even knew existed. 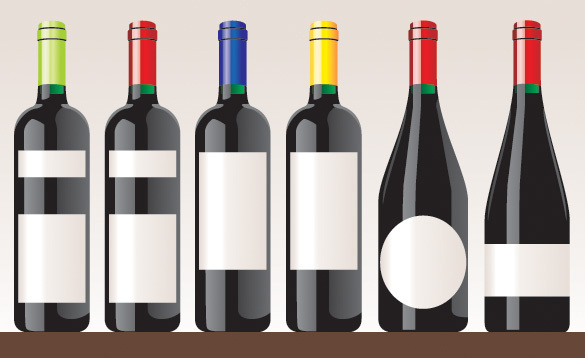 Its easy to be all blase by saying that the big corporate monoliths are just plying us with standard Merlot's from Chile, White Zinfandel's from California or Shiraz from Australia, but supermarkets have upped their games recently and for our benefit. Grapes varieties as wide ranging as Pedro Ximenez from Chile, Ugni Blanc from the south of France and Touriga Nacional in Argentina are all sitting pride of place on retailers shelves and they are all at really accessible prices for us all to discover. Never one to pass up an opportunity to experiment and spend some disposable income on trying something brand new, I decided to satisfy my curious nature and grab some weird and wonderful grape varieties to try at home. First on my hitlist was the Toro Loco Rose, priced at a ridiculously cheap £3.69 a bottle from Aldi. Made from 100% Bobal, a grape variety that is grown in the bucketloads in the Utiel Requena region of Spain, west of Valencia in Southern Spain. It has a deep colour to it and is tame in its alcohol content. Usually used to make the bulk red and rose wine that is served in the Tapas restaurants of the east coast, when a bit of TLC is pushed in its direction, it can produce pretty decent wines. This one has the distinct smell of summer fruits and strawberries on the nose, with a bit of creaminess too (I would've said it smells of those Campino sweets that you get, but I gotta try and keep this high-brow...). Good start in my book. The first sip, however, slightly disappointed. Much lighter fruits and a mild acidity meant that it didn't reach the heights of refreshment that I wanted. Flavour seems to have taken a bit of a back seat too, and left me a wanting a bit more. But, hey, if you've paid £3.69 for it, you're not expecting an Oscar winner, are you? Decent fair for the money. 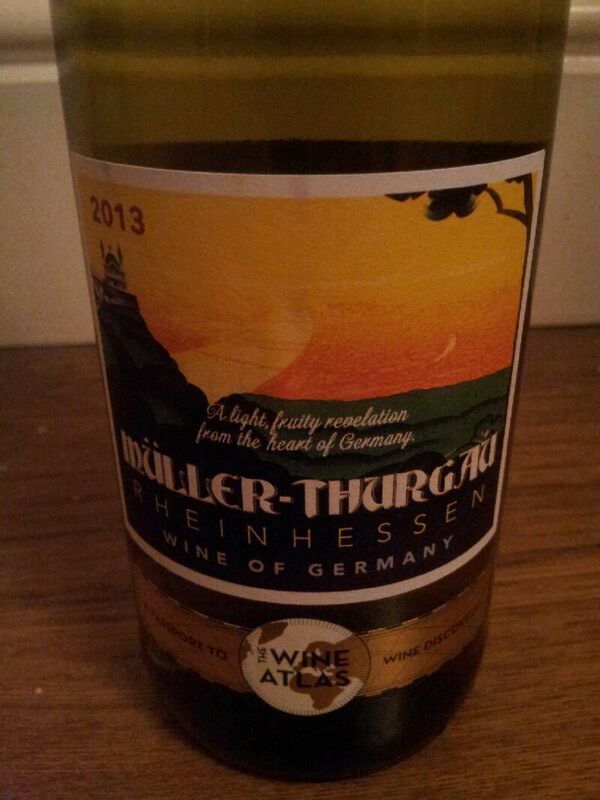 Next up was a Muller Thurgau white from Asda, coming in at £4.95. A grape that is quite well known in Germany (especially in the Rheinhessen region in the west of Germany, where it is the main constituent of Liebfraumilch), its the third most planted grape over there, and has a few hundred hectares on these fair shores. This wine, rather than the famous sweet wine it makes in Germany, is dry and has a real citrus kick in terms of the nose. Really apple-y and lemon-y, its sings of summer drinking. The thing that straight away jumped out when I put the glass to my mouth was a slight spritz to the wine (I had to check that The Lass hadn't managed to switch the wine with a soft drink of some sorts). It then followed through with a cheeky citrus kick and a bit of minerality to bring out the slate soils its been grown in. 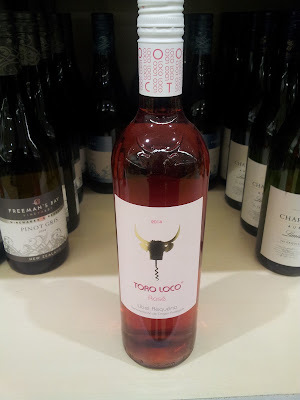 Fabulous value for money if you can see past the slightly unpronounceable name. 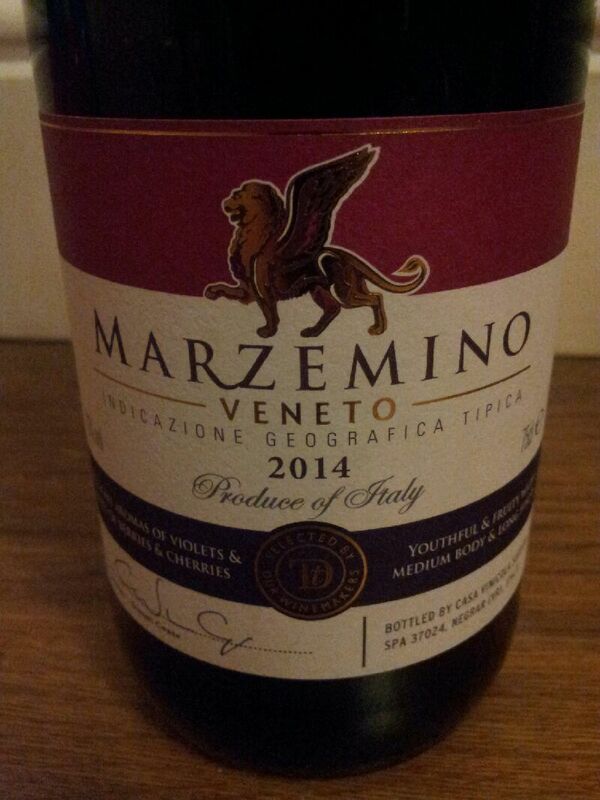 Third on the week's wine list was the Marzemino Veneto from Sainsburys, priced at £7 a pop. I'd been looking at this wine for a good long while, as I'd never heard of it and thought now was as good a time as any to be stunned at its greatness, or shocked at its shoddiness. 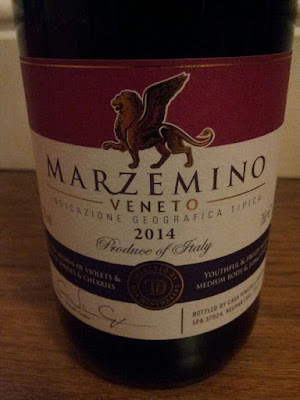 Marzemino is quite highly regarded by winemakers in the north of Italy, so I was looking forward to it. Upon pouring, it looked rather light in colour, but the smell blew me away. Bitter cherry, violets, white pepper and licorice slapped my nostrils like a 'Hayemaker' to the jawline. This set me up for, what I hoped to be, would be a wonderful wine. How wrong was I. Highly acidic, a bit bitter and very, very light on flavour, I couldn't understand where all the flavour on the nose had gone to. However, never one to give up, I decided to give it one more shot at glory and put it in the fridge for a short while, thinking a slight chill on it may help it. To its credit, the chilly stint it experienced did it the power of good. A crisp bit of crunchy fruit, the tartness of dark cherry and raspberry followed, reminding me of Beaujolais Villages wines. A refreshing wine, but not going to be to everybody's taste. Penultimate for this sipping study was the Paul Mas 'Vinus' Clairette du Languedoc from Morrisons, priced at £8 a bottle. Clairette is grown a fair bit in the south of France, mainly to make the cocktail favourite Vermouth and a couple of pretty quirky sparkling wines. Not one to be seen as alone in the bottle, its usually blended with other varieties to give it a bit more ooomph. This one has a real texture, laying some kind of wine-based carpet on my tongue, but having a real flavour of light peach and apple pudding on the taste and smell. A little bit lacking in the acidity department, so definitely one to be having with food, but a steal of a wine at 8 of the Queen's english. 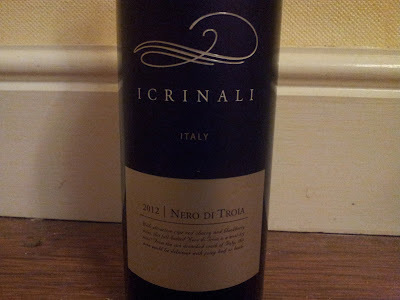 Bringing up the rear is the Nero Di Troia from I Crinali, selling at Morrisons for £5. A grape that was used to bulk up regional blends, due to its high tannin content, its only recently that its being made into single grape wine and is wowing consumers and critics alike. This example is, from what I read, to type. Opening it up, its a dark purple wine, with a strong fragrance of plums, spices and a slight herby note. To taste, those tannins do what they are supposed to and take hold of your gums and have a party. 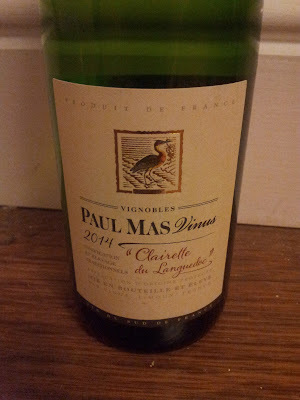 A bit drying, but the fruity nature of the wine balances it out enough to make it a pleasant experience. For a fiver, you could do a lot worse (and I have). To take a punt on a few new grape varieties is what makes wine so fun. There is no shame in sticking to the tried and trusted fruity numbers that you know and love, but sometimes, just sometimes, its worth wondering along the track marked 'Unknown' and seeing where it takes you. Have you any suggestions of other 'new' varieties to try? Feel free to comment below, or on our Facebook page or on Twitter!